Dealing with satellite interference is not easy but this company's product can routinely locate satellite interference well within 5 km of the source. The satID®'s geolocation capabilities can routinely locate satellite interference well within 5 km of the source and the TDMA geolocation module enables satID to classify the signals from a TDMA network and provide geolocation results per terminal using advanced classification, filtering and processing. Additionally, the TDMA's SatGuard technology identifies VSAT terminals by their ID to generate significantly more geolocation results. David Wilkinson, Kratos’ satID Product Manager said that the TDMA network geolocation module dramatically improves the geolocation process for their customers, and the advanced capability transforms the way TDMA geolocation is performed. Operators are able to identify the specific terminals causing interference and pinpoint their exact location to rapidly address quality of service issues. Beyond interference mitigation the TDMA network geolocation module can help organizations in the satellite industry gain much better visibility into VSAT networks. By geolocating VSAT networks, it becomes possible to profile and understand TDMA network usage enabling improved operations. 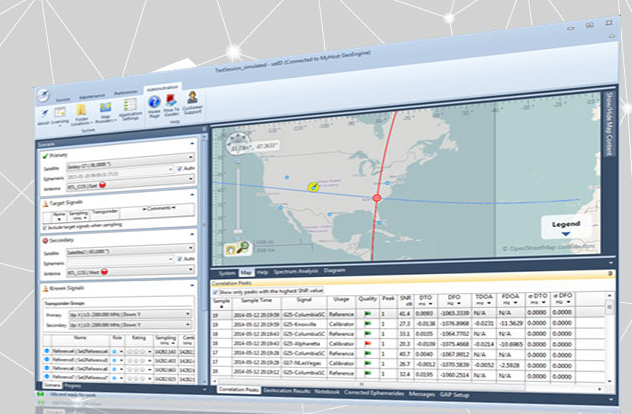 As an example, with an understanding of where VSAT terminals are located, satellite operators are able to improve capacity planning efforts to optimize beam coverage and bandwidth allocation. The TDMA network geolocation capability adds to the existing modules available for satID. These modules include a signal cancellation capability that leverages the technology from Kratos’ SigX product to enable customers to perform geolocation scenarios much more efficiently and effectively. The module helps mitigate the effects of blocking carriers with a real-time signal removal capability. In addition, an advanced spectrum analysis option employs features from Kratos’ Monics® carrier monitoring product to provide carrier-under-carrier, modulation analysis and a new threshold triggering capability within satID. Kratos’ satID is part of the Monics family of advanced carrier monitoring and interference mitigation suite of products. The RFI mitigation suite includes carrier monitoring capabilities from Monics, VSAT interference management from SatGuard and signal cancellation from SigX.